All transactions are safe and secure with a reliable history in online purchasing behind each of our associates. 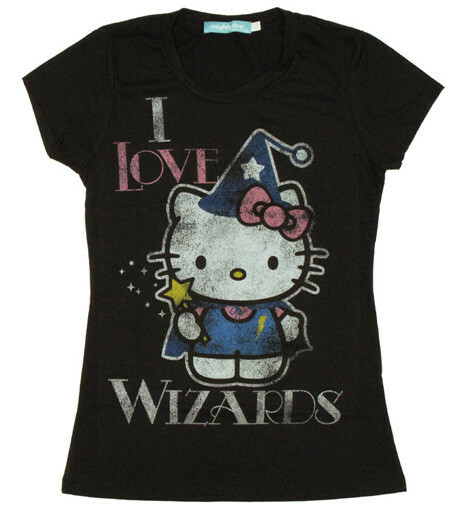 Buy the I Love Wizards Hello Kitty shirt to own Hello Kitty clothing and merchandise. Is that Kitty White or her twin sister Mimmy White? It is Hello Kitty herself and she has given up her normal look for a Harry Potter inspired wizard costume. Her loving twin Miss Mimmy normally wears a yellow bow so she doesn't confuse people. Mimmy sees no need to cause a scene wherever she goes. She prefers a more quiet life baking cookies for her family. Her sister Kitty though is getting use to being in the dapper one as this Hello Kitty tee shirt shows. Get your own piece of this sassy star. Conceal it under a black sweatshirt. In addition to the I Love Wizards Hello Kitty tee above, browse the Hello Kitty Clothing Gallery for more apparel like men's and women's clothes, kids shirts or hoodies.